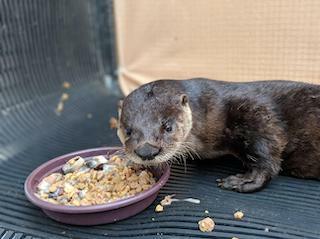 A young male North American River Otter was admitted to the hospital after being transferred from Peace River Wildife Center. The otter was hit by a vehicle while crossing the road in Port Charlotte, Florida. He suffered a fractured femur in his left rear leg. When he arrived, he was obtunded and very warm. Otters have a thick coat of fur that can cause them to overheat when stressed, or in this case from the shock of the accident. 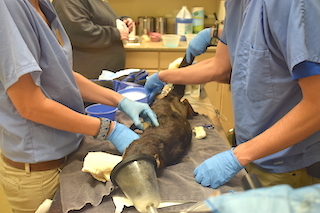 Upon intake, veterinarians immediately got to work to stabilize the injured otter. He was hyperthermic (overheated), so they placed a catheter and began administering fluids that were run through cold water to help cool him down. He was also given pain medications. A fan was kept blowing in the room and staff performed hourly checks of his vital signs throughout the night. Just two days after being admitted, the otter has started to show signs of improvement. 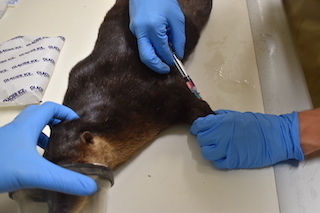 Veterinarians removed the catheter providing fluids and the otter was noted to be much more active, including biting at the enclosure door and seeking an exit any time the door is opened. 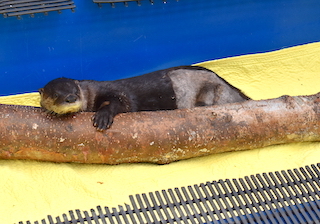 Despite having to be assist-fed during the first 24 hours, the otter is now eating on its own. Surgery to address the fractured femur has been scheduled for Monday morning. The otter was quiet but alert this morning. Veterinarians noted yesterday that he was an excellent candidate for surgery. 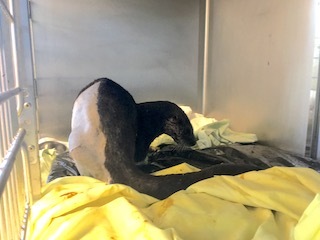 Due to the complexity of the surgery needed for the otter, he was sedated and taken to Specialized Veterinary Services (Blue Pearl) in Fort Myers. Dr. Eisele (SVS/Blue Pearl) will be performing the surgery to place a plate that will stabilize the fracture. 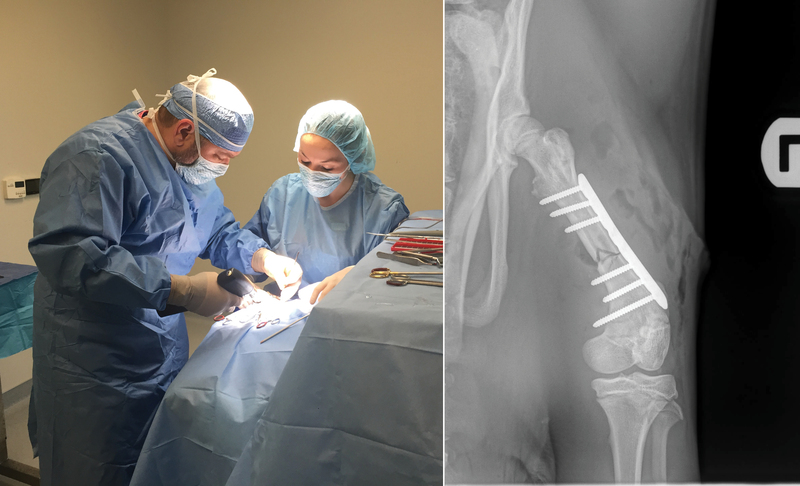 Dr. Eisele (SVS/Blue Pearl) placed a stainless steel bone plate with six screws to stabilize the fractured femur of the otter. The actual surgery took approximately 45 minutes, however with prepping the patient for surgery, pre-op and post-op radiographs, the total time was approximately three hours. After surgery, the otter was transported back to CROW where he will receive post-op care and rehabilitation. 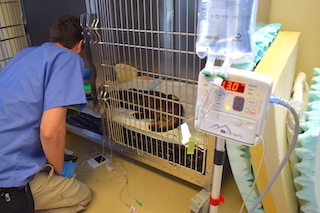 Staff and students provided care throughout the night to ensure he recovered fully from the sedation and anesthesia. This morning, he was bright and alert, and was eating and drinking. Staff is also monitoring him to ensure that the surgery site is kept clean, a task that can be quite difficult for an otter. Post-surgery recovery has been going well for the otter. Veterinary staff says that the normal swelling associated with surgery has subsided and that the site looks good. He is eating well and staff will be looking to move him to a small outdoor enclosure later this week. The otter was moved to a small outdoor enclosure to give him a little bit more space, but still limit his movement as he recovers. He has started to receive supervised tub time and rehab staff are able to provide more environmental enrichment. 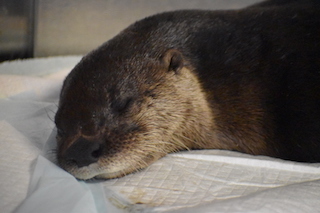 Veterinary staff noted that the otter has started to bear weight, but is still lame in its injured leg, as would be expected as he heals from the surgery. While transitioning the otter to a small outdoor enclosure, he experienced an implant failure most likely due to excessive activity/force on the leg which was diagnosed on 2/21. The following day, he was taken back to Blue Pearl and Dr. Eisele repaired it using an IM pin and 2.7 plate. The otter was returned to CROW the same day and continues its recovery. His prognosis still remains guarded, but he is eating well and continues to be closely monitored by rehabilitation staff. This morning, the river otter received a one week post-surgery check. The otter was anesthetized and veterinarians took radiographs, cleaned the surgery site and drew blood for some diagnostic checks. The team says that the new fixtures have remained in place, but the otter still has a long road to a full recovery. Veterinary staff report that the otter is now placing its injured leg when ambulating (walking), but is still hesitant about putting his full weight on it. He has also been reluctant to utilize his supervised swim time but he has maintained an excellent appetite, especially for fish. According to veterinarians, the otter's incision site from surgery continues to heal well. The otter is also starting to ambulate, or walk, more normally and was noted to be climbing in and out of the dry pool in its enclosure with "apparent ease". The otter continues to receive supervised time where the pool is filled with water, but still has only minor interest in swimming. He puts his head and feet in the water, but will not go in completely. 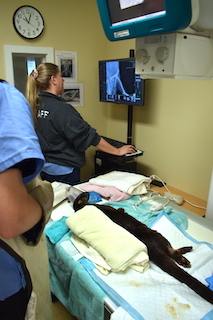 Today, the otter received its three week post surgery check-up by the CROW veterinary team. During the check, the otter was anesthetized. 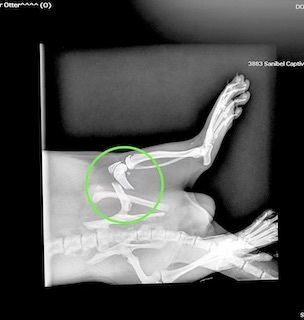 Radiographs were taken that showed his hardware was all still in the proper places and the bones had signs of healing. Veterinarians also took a blood sample to check his blood chemistry. Lastly, they administered vaccinations. After the otter recovered from his check-up, he was brought back outside to the larger "Otter Enclosure". Veterinarians have noted that the otter has had better use of his injured leg and the extra space will allow him to continue using it more. The enclosure also has a large pool that the otter can swim in. This enclosure is equipped with a live feed camera that you can watch at www.crowclinic.org/webcams! A wild otter spends lots of time in the water to hunt for fish and other prey. 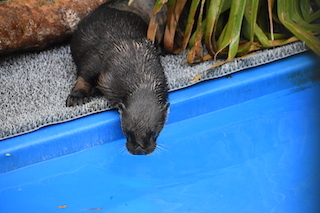 Over the last few days, the otter has began using the deep pool on his own to swim! 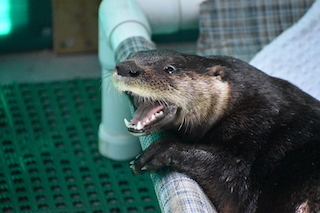 This behavior is very encouraging and will be helpful for the otter to further rehabilitate his injured leg. 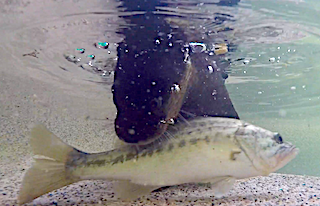 One of the next steps will be introducing live prey into the pool so his hunting abilities can be evaluated. Over the weekend, the otter began receiving some live prey enrichment. 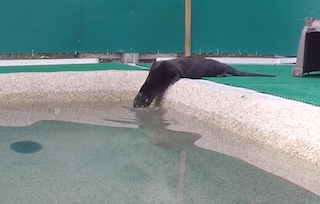 The live fish presents a challenge for the otter to get his food which allows him to exercise the injured leg and maintain his hunting instincts. He was successful in catching all of the fish that were provided for him. You can watch a video of his successful catch on our YouTube Channel.